Immediately after Her lecture in London, with Master's merciful permission, a three-day international retreat was held in England at Pontin's Hemsby Holiday Center in Norwich, a small town on the southern coast of England, east of London. The Center is a quiet and beautiful place in a lush country setting, with numerous two-story buildings and much greenery. About 1,600 fellow initiates from around the world participated in the retreat. On the morning of June 10, 1999, when the working team was preparing for the retreat and fellow initiates were beginning to arrive, our beloved Master came to the retreat site by Herself, which made us all feel a great sense of warmth in our hearts, although the weather was chilly. Master then walked around and greeted everyone present. Although we knew She must have been tired from Her tightly scheduled and demanding lecture tour, all we could feel was the immense loving power radiating from Her merciful eyes. In the afternoon, Master walked around the retreat site again, including the exhibition area for Her Celestial Jewelry and Clothes, the bookstore, the kitchen, the meditation hall and the registration desk, and kindly said hello to fellow initiates. In the evening, as initiates were meditating in the meditation hall, Master quietly came in and meditated with us for a while. Then She silently walked around the hall and blessed the fellow initiates. After the meditation, Master told us that we had finished our lecture tour the previous night and the warring parties in Kosovo also had signed a peace treaty that same night, (and same hour!) She continued in a joking tone, saying that otherwise the world could not have lasted to the year 2000, just as Nostradamus had predicted. "Of course, it would not matter to us, but we did this for others. So I am glad they signed the peace treaty. I hope they will keep it." Master also said that She was very proud of the fellow initiates. Many went into a deep level of consciousness during meditation. After initiation, we cannot run away from the light of God. She added that She was very happy to see our progress, especially the newcomers, who also meditated very well. A sister initiate from Slovenia then expressed her gratitude to Master for helping her country uplift itself spiritually. Master said that the Slovenian people are very pure, and that many of them had received initiation. Master then told us about some of Her own experiences during the lecture tour. In order to concentrate on preparing for the lectures, Master had done many things by Herself, including booking airplane tickets and hotels and renting cars. When She arrived in Slovenia, She found that Her rental car had a manual gearshift and thus was very difficult for Her to drive. Although it was the first time She had driven such a car, She finally made it to the hotel after some strenuous effort. Reflecting on this experience, She said that we have to do things independently because we are born alone and we die alone. Then Master left the stage and walked joyfully among the fellow initiates. She thanked the people who had helped Her during the lecture tour. However She also reminded us again that the more we help others the more we help ourselves. The quickest way to progress, besides keeping the precepts and meditating, is helping others to get enlightened. 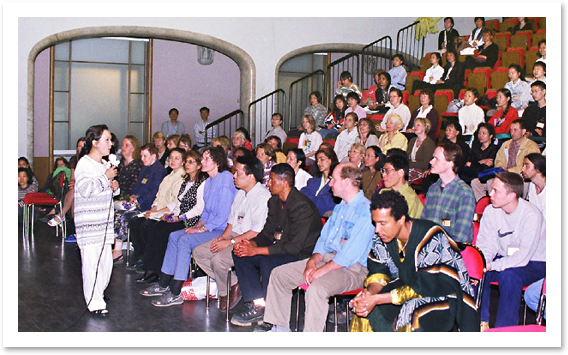 On June 11, 1999 at four o'clock in the morning, the international three-day retreat officially began. Fellow initiates were grouped and took turns sitting on the stage. Master quietly came to meditate with us during the second session. She blessed the fellow initiates on and near the stage. After meditation in the afternoon, Master made a short speech, reminding us that God will come when we meditate. Sometimes we think that we have not progressed, but actually we have. We cannot escape from the light, as long as we keep the precepts. She felt that the disciples, especially the newcomers, were very strong, and explained that natural disasters and wars can make people become more concentrated and grow up spiritually. Then Master told a story about Kabir: A spiritual seeker went to see Kabir, but Kabir was not home. Kabir's wife told the seeker that he had gone to a funeral with some people because a local person had just died. The seeker asked her how to recognize Kabir, and she said. "Whoever you see who has light around him is Kabir." Then the seeker went to the graveyard. However, he saw that everyone there had light around him, so he could not tell which one was Kabir. Then he went back to Kabir's wife and told her that everyone there had had light around him. Kabir's wife said, "Go to look again, because now the funeral should be finished. If you see a person who has light around him now, that person is Kabir." The seeker went back to the graveyard and this time only one person had light around him. So he knew which one was Kabir. Then he asked Kabir why this had happened, and Kabir explained to him, "Ordinary people have light around them when they think about the ephemeral nature of life and death during a funeral, but they forget about this topic right after the funeral and lose the light, but a Master is always concentrated, and hence always has light around him." During the last session of meditation on the first day of the retreat, Master answered fellow initiates' questions. One brother initiate said that he had problems when meditating, because he often slept or lost concentration. In response, Master said that actually we don't have problems; the mind has them. The mind plays tricks on us. When this happens, we should tune our minds gradually. We should make meditation a fun event. Add some social flavor to the meditation. For example, invite other initiates to come and meditate with you, or go to other initiates' homes to have tea and meditate together. Each initiate has a different situation: Some may be able to do meditation well and quickly and some may have to take time to make it go well. During the early morning session of the retreat's second day, Master came to join the group meditation. During the lunch break that day, Master again toured the retreat site, greeting working team members, telling jokes to them and thanking them for their selfless service to others. Master left the retreat site on the same day for another part of the world that needed Her urgently, to carry on Her mission. Although She left the retreat site, Her love and blessing were still with us during the rest of the retreat. The London Three-Day Retreat ended at noon on Sunday, June 13th. At the end of the last session of meditation, the retreat announcer conveyed Master's note of congratulations to us on a successful retreat, and Her wish that everyone had a happy journey home. 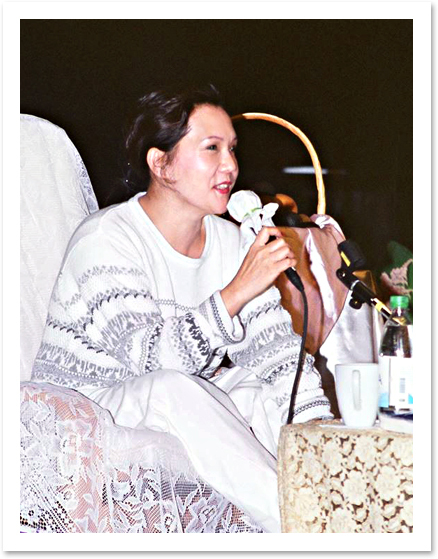 Indeed, the London Retreat was very successful, and the most memorable thing everyone experienced was the strong uplifting power that Master transmitted when She blessed fellow initiates one by one. All the initiates who participated went home glowing with Master's boundless love, which will bless us forever and ever.